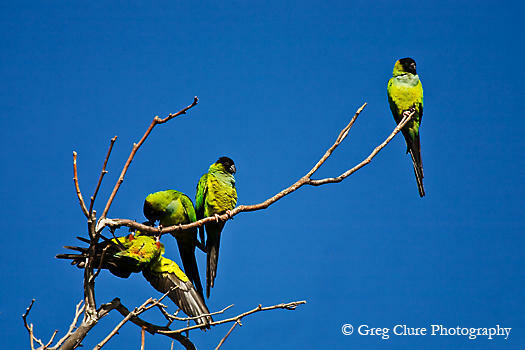 A flock of black-hooded parakeets call Big Sycamore Canyon home. As seen in the images provided by fine art photographer Greg Clure, more than four dozen of these birds live in the canyon. Twelve to fourteen inches in length with mostly green bodies with black heads and beaks, they are fairly large birds. If you are fortunate enough to see one up close you will notice the pale blue wash on the breast and red thighs. Mostly descendants of escaped or released cage birds, these parakeets now flourish in the temperate climate of Southern California. You can typically find them roosting in the sycamore trees at dawn and dusk above the Big Sycamore Maintenance Station at the the entrance to the campground across PCH from Sycamore Cove. During the day they can commonly be found throughout Big Sycamore Canyon from the campground up to 5 or 6 miles inland as they forage for food. They are easy to find; just listen...they are the loudest sounding birds in the canyon. The southern entrance to Big Sycamore Canyon is in Point Mugu State Park, located a few miles south of Mugu Rock/Pt. Mugu on PCH. It is about a 15 mile drive from the Camarillo Premium Outlets and about 25 miles from the heart of Thousand Oaks taking either the 101/Lewis Road route or the slightly slower, curvy and interesting Potrero Road route. Alternatively, you can access Big Sycamore Canyon from the northern end at several points along Potrero Road between Rancho Sierra Vista/Satwiwa and Hidden Valley at the southern edge of Newbury Park and Thousand Oaks. A great place to hike or mountain bike, the next time you are in the canyon keep an eye out for these brightly colored members of the parrot family. See more of Greg Clure Photography's Fine Art Images of Nature at www.gregclurephotography.com.